Deliver gorgeous, all-season serve ware color and style to the table along with tasty dishes, with the Paula Den Dinnerware Indigo Blossom 10-Inch x 14-Inch Stoneware Oval Serving Platter. In delicate play against a solid white background, Indigo Blossom captures the whimsical charm of a butterfly aloft and a bluebird alight on a fruit tree in fullest bloom. A mix of deep-toned and lighter blues delicately dance around each serving piece from this beautiful, sturdy stoneware serve ware collection. The stoneware is sturdy enough for day-to-day dining, and stylish enough for any special mealtime. This platter is ideal for serving and savoring favorite family foods and beverages at a casual breakfast, a relaxing lunch, or weekend dinner. 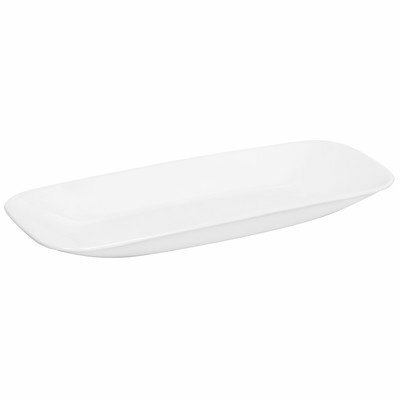 For convenience, the platter is microwave, freezer, and dishwasher safe, oven safe to 250 Degree for up to twenty minutes for warming, and a great complement to other pieces in the Paula Den(r) collection. Let a touch of springtime whimsy bloom, when serving delicious main courses and more with the charming, durable Paula Den(r) Dinnerware Indigo Blossom 10-Inch x 14-Inch Stoneware Oval Serving Platter.